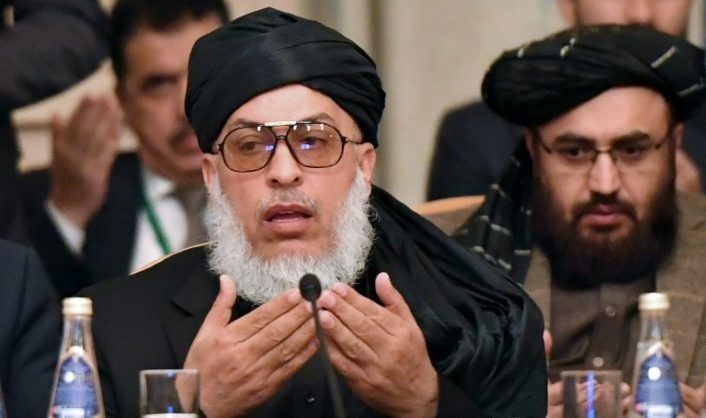 The Taliban demanded a new constitution for Afghanistan and promised an “inclusive Islamic system” to govern the war-torn country at a rare gathering with senior Afghan politicians in Russia Tuesday that excluded the Kabul government. The insurgents’ manifesto, outlined in Moscow before some of Afghanistan’s most influential leaders, comes a week after the Taliban held unprecedented six-day talks with US negotiators in Doha about ending the 17-year war. The Doha and Moscow discussions, though entirely separate, both excluded the government in Kabul, where President Ashraf Ghani is seen as increasingly sidelined from key negotiations for peace in his country. The Moscow meeting — the Taliban’s most significant with Afghan politicians in recent memory — saw the insurgents praying together with sworn enemies including former president Hamid Karzai as they discussed their vision for the future. “The Kabul government constitution is invalid. It has been imported from the West and is an obstacle to peace,” Sher Mohammad Abbas Stanikzai, who headed the Taliban delegation, told attendees at a central Moscow hotel. “It is conflicted. We want an Islamic constitution,” he said, adding that the new charter would be drafted by Islamic scholars. No representatives from the Kabul government were invited to Moscow but some of Ghani’s chief rivals — including Karzai as well as opponents in an election slated for July — were in attendance. Ghani’s allies in Washington insist Afghans should lead the peace process, and the months-long push by the US to engage the Taliban has ostensibly been aimed at convincing them to negotiate with the government in Kabul. Those efforts culminated in six days of talks between the US and the Taliban in January where both sides touted “progress” — stoking Afghan fears that America could cut a deal to withdraw its troops before a lasting peace with Kabul is reached. Ghani has repeatedly said that all Afghans should agree on the need to end hostilities and an eventual withdrawal of foreign forces, but that he would not “surrender to a temporary peace deal”. The Taliban consider Ghani and his administration to be US puppets, and have refused offers to talk a truce. Stanikzai said the insurgents, who ruled Afghanistan under a ruthless interpretation of Sharia law between 1996 and 2001, did not want a “monopoly of power” but “an inclusive Islamic system”. They also promised to stamp out Afghanistan’s poppy cultivation and take steps to prevent civilian casualties in a conflict that has killed and wounded hundreds of thousands. Two women attended the roundtable conference. The Taliban closed girls’ schools and banned women from working under their regime, but have indicated they could loosen some guidelines in line with Sharia law. “I think all sides are ready for a compromise. It is a good start,” said Muhammad Ghulam Jalal, the head of an Afghan diaspora group who hosted the meeting. But images of Karzai and other powerful leaders attending prayer lead by a Taliban figure and dining with the militants invoked anger in Afghanistan.